The first day of Spring began at 0328 hours, Pacific Standard Time, Monday, March 20, 2017. This only applies to the Northern Hemisphere. It is also called the Vernal Equinox. The word equinox comes to us from the Latin language. Who would have thought that we would all be learning some Latin on the first day of Spring? A bit of Latin won’t hurt you! Equinox means equal night – aequus is (equal) and nox is (night). Seems simple enough, and that’s your Latin lesson for today. As a matter of fact, it is the only Latin lesson I will be teaching you until the Summer Solstice when summer begins the next season. Let’s have a look at what the fuss is all about. Let’s look at who gets all happy and fuzzy about this new season. The most important group to consider first is us, … the common people. The reason for this is very simple – we are the ones that have been waking up all winter in the dark and making our way, to often mundane jobs and returning home to our loved ones again, in the dark. This usually accompanied with lots of rain and snow. We were all excited, last year when winter began on December 21, 2016, at 0644 hours Pacific Standard Time in the Northern Hemisphere. New message to the “season-keeper” – we have all had enough! … except of course for the skiers and snowboarders who refuse to come down the mountain. Another group of people that get all excited about the arrival of Spring are the astronomers. They are the ones that stay up all night looking at the heavens and making all these complicated calculations about the seasons. They tell us that the Spring Equinox falls on March 19 or 20 every year in the Northern Hemisphere. This equinox occurs at the same moment worldwide even when our clocks reflect a different time zone. The Weather Scientists divide the year and the seasons differently. For them, Spring begins on March 1, Summer on June 1, Autumn on September 1 and Winter on December 1. They divide the year into Quarters this way to compare statistics seasonally and monthly. They like to change the seasons a bit and adjust them for their own convenience, very much in the same fashion as the people that move the clock back and forth 1-hour – to make our lives easier and gives us more daylight! … you’re not giving us more daylight and you’re not accurately giving us the temperatures of the season. Get with the program. The Middle Ages are over. This is about Science. Enough with the science lessons. Yesterday while walking along the river, I saw my first swallow of the year. It was a barn swallow and he had brought many of his friends and family along to gorge on flies and other insect species and to show-off his superb flying skills. I’m so relieved that there were no “scientific types” there to tell me how to enjoy my day while I was being entertained with their flying prowess. Swallows are tiny birds that spend most of their time in the air. They are graceful fliers and pursue their insect prey with zeal. The Martins and the Swifts are similar fliers but they are considered as different species.As always the Eagles, the Crows and a myriad of water ducks are all involved in courtship, mating, and nest-building. What a joyous time of year to be walking in Nature. Everywhere you look, life is beginning a new cycle. The buds are appearing on the trees, the mammals are relishing the sunlight and of course, the flowers are bringing their palette of color to this wondrous occasion. All these fascinating pieces of life contained in Nature, … all coming to life in the new season, … all totally unaware that today is the Vernal Equinox. Perhaps sadder for us humans, … that we do not spend more time in their wonderful house of life and simplicity. 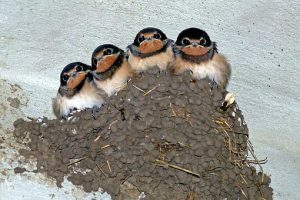 If you have any comments, questions, or suggestions about swallows and the Spring season, do not hesitate to leave them in the space below. I will answer them all in a timely manner. Thanks for reading my first blog of the season and I look forward to your return.